Ombre is everywhere at the moment. You cannot pass a pinterest pinboard without seeing Alexa Chung’s trademark graduated colour bob or dip-dyed hairstyles in a range of colours on beautiful surfer-chic models. Clothing is in a range of light to dark hues, eyeshadow graduates across eyes like blended rainbows and even nails are sporting the trend. Of course, in my (non-ombred) eyes, a trend isn’t a trend until it has hit the food boards, and now bakers have started to create cakes that have beautiful colourful layers hidden beneath swaths of creamy frosting, like a hidden cake paradise. I chose to jump on this cake bandwagon in order to celebrate 24 years of my parents’ marriage and thought the extra surprise of the ombre insides might be a pretty addition to the delicate rosewater and white chocolate frosting. I chose pink as my colour scheme, as a sad little cliché to the romance of it all, but this cake is far from sickly sweet. A simple vanilla sponge is the starting point for this cake, coloured to graduate from peachy pink to a dark fuchsia, sandwiched with raspberry jam and wrapped in a fragrant cuddle of smooth cream coloured frosting. Add a homemade bunting banner and this is a celebration cake that oozes style. Of course, you can adapt this recipe to suit your own celebration, such as blue for a summer party or orange with a dark chocolate frosting come Halloween. And if the bunting cake topper isn’t to your taste or celebration, try unsprayed flowers, toys or an edging of sprinkles for a simple yet effective finishing touch. Preheat the oven to 170oc/160oc fan/gas mark 3. Grease four 20cm sandwich tins, line with baking parchment and set to one side. In a large bowl whisk together the butter and caster sugar using a hand mixer until light and fluffy. Add each egg one at a time, whisking continuously until fully combined. It may split slightly, but the flour will bring it back together. Sift together the flour and baking powder, then fold into the butter, sugar and egg mix until fully incorporated. Stir through the vanilla paste and 2 tablespoons of milk to loosen to a dropping consistency, then spilt the cake mix into four bowls. Carefully colour the first bowl with a small drop of colouring to a peachy pink colour, the second to a light pink, the third a strawberry pink and the final bowl a deep fuchsia. Remember, it is easier to add more colour than to take away, so colour each bowl carefully and keep comparing – you don’t want two bowls exactly the same, rather a colour scheme that will gradually get darker down the layers. 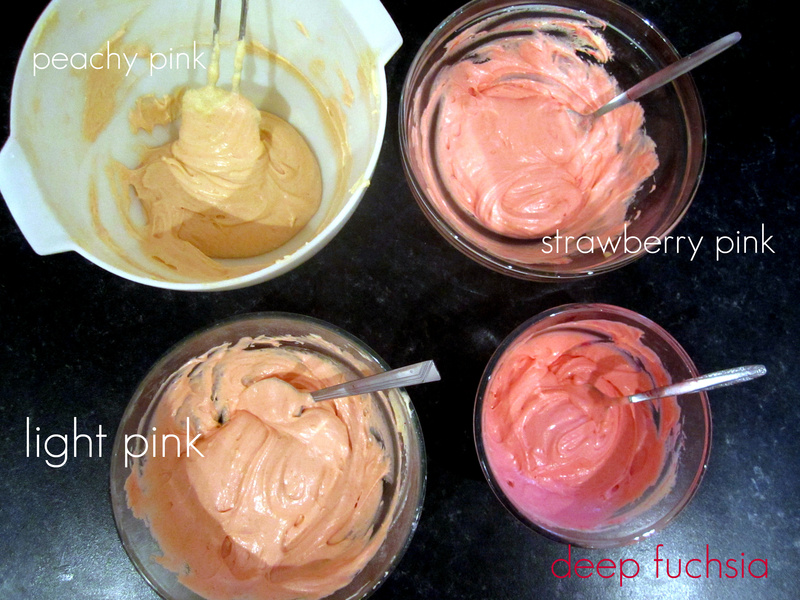 Spoon each cake mix into the tins and label accordingly with stickers –1 for the lightest colour and 4 for the darkest. Each cake will be golden once they come out the oven and it will be difficult to tell which is which without labelling! Once labelled, place in the oven and bake for 25 minutes until golden and cooked through. Remove from the oven and cool in the tins for 15 minutes, then transfer to a wire rack to cool, remembering to remove the cake labels from the tins and placing next to the corresponding cake to keep track of which is which. Once the cakes have cooled, you can make the frosting. Place a heatproof bowl over a pan of barely simmering water and melt the chocolate slowly, taking care not to let the bowl touch the water. Once melted, remove the bowl from the heat and leave to cool. In a saucepan, add the double cream and butter and slowly bring to a simmer, whisking all the time. Once simmered, pour over the chocolate and whisk immediately. Add the rosewater and icing sugar, whisk again, then leave to cool. To assemble, firstly trim the tops of the cakes so they are level and will sit straight. On a serving board, place the darkest cake (number 4) right way up. Spread over 1 tablespoon of jam and place cake number 3 on top, upside down (this keeps the cake as flat as possible). Repeat the jam layer and add cake number 2 right side up, a final jam layer then cake number 1 upside down. Quickly scan round the cake to make sure it is as level as possible, and then you can start frosting. For an even finish, I did three layers, but if you are short of time, a quick slathering of this frosting will still look beautiful. Firstly add about a third of the frosting to the top of the cake with a palate knife and tease across the top and sides of the cake. 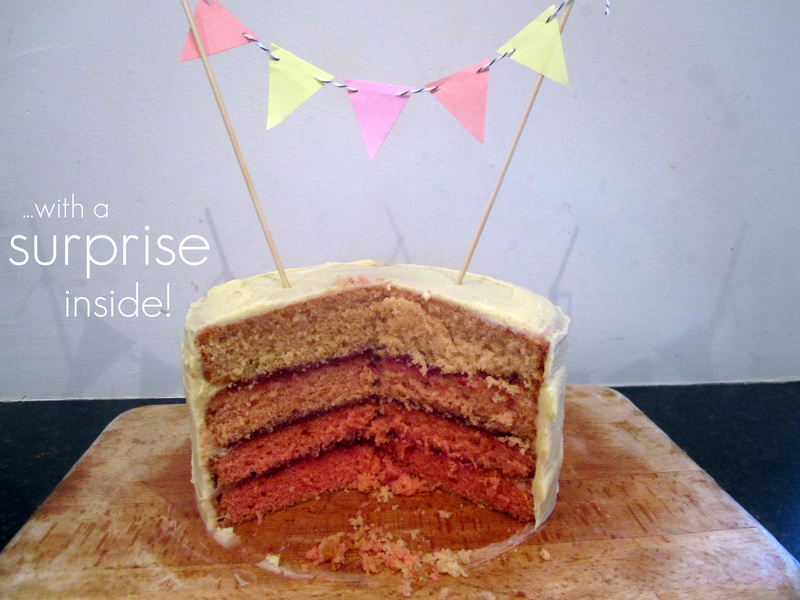 With this first layer, you want to fill any gaps between the cakes. If the jam starts to mix in with the frosting and it begins to get a bit crummy, don’t panic, this is only the first layer! Once smoothed round the sides, leave to set for 15-20 minutes, then build up a second layer with another third of the frosting. This is to begin to hide the signs of the cake layers and will be easier now you have a smoother starting point. Leave to set for another 15-20 minutes, then go back to finish your final layer with the remaining frosting. The cake should now be smooth, with a good layer of frosting and will be a pretty impressive height with its four secret layers. To finish, decorate according to your chosen celebration. I made a string of paper bunting from the Joy the Baker blog, and a tutorial for this can be found here. However you decide to decorate, you will not be able to hide your joy from the initial wow factor of this cake and the secondary wow factor of the layered insides. Happy Celebrations! That looks gorgeous! Very impressive. 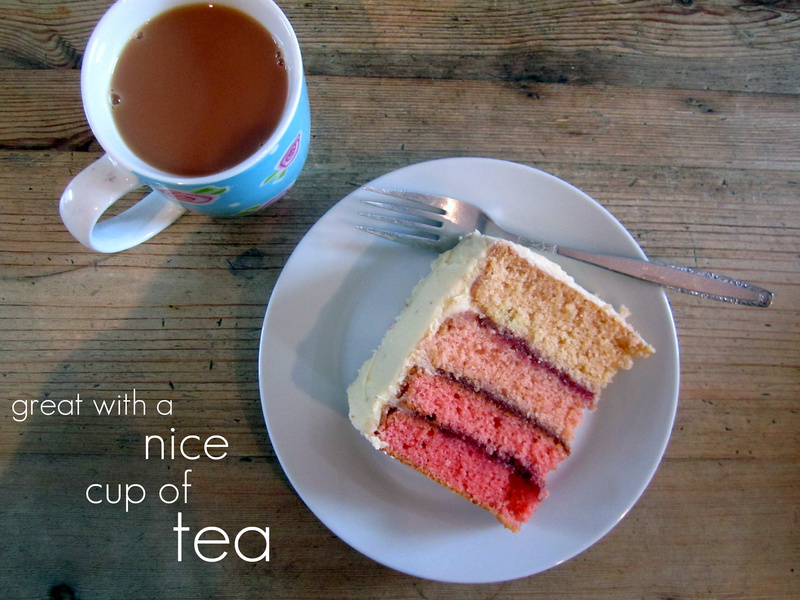 Love this cake and agree it would be great with a cup of tea! 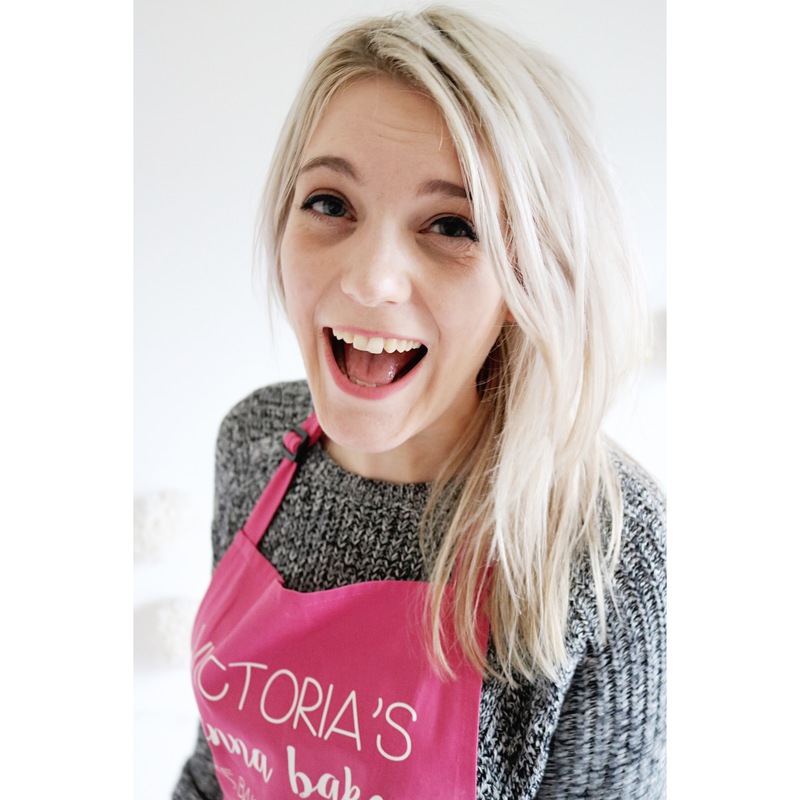 We’re appealing for people to get baking, to get elderly people together over a cuppa, and raise funds for WRVS. Would be great if baking fans would get involved and enter their favourite recipes at bakeoff.bupa.co.uk before midnight on Friday 8 March!